Email Ethics: It will soon be too late! On funny thing next week is that two webmail providers gave their users a deadline, please note one deadline is more critical than the other one. The first critical notice is of course given by Lycos europe login pages. As it has already been discussed on this blog, Lycos europe is closing down. Since they apparently didn't find another provider to continue providing the service, then all the Lycos hosted emails will be deleted on February the 15th. It means for users, they have to dowload and backup all important data still on one of the Lycos europe hosted domains. For email marketers, it means it's your last week to try to have the users update their contact email, on february the 16th all you will be able to do is suppress all the Lycos europe hosted email addresses from your lists. The second deadline is set by Gmail ont the Official Gmail Blog: Last chance for Gmail stickers post. 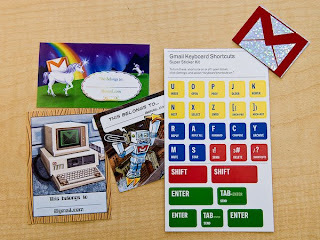 After February the 14th, they will stop sending nice looking gmail keyboard stickers to users asking for some. You still have a couple of days to request your set of stickers.